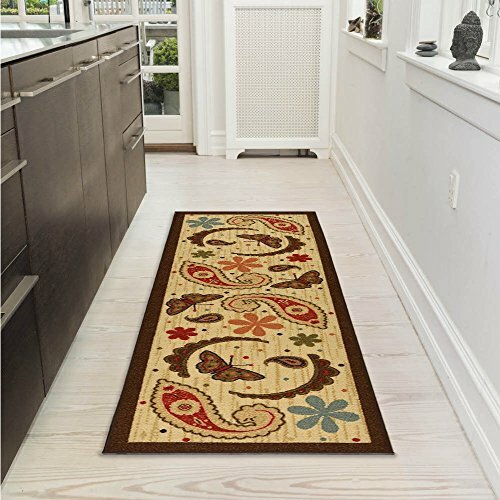 Our Ottomanson Sara's Kitchen Paisley Design Mat Runner Rug features an elegant and attractive paisley design accompanied with detailed motifs like beautifully-colored floral patterns and butterflies on the beige background bordered with dark brown edges. This contemporary fancy runner rug showcases the main colors of tan and dark brown, with charming touches of teal and burgundy. More than being a sophisticatedly-accented floor covering with the paint of both warm and cool hues, this rug is quality constructed with premium nylon fibers and reinforced overlock edges for proven wear-stain-and-shed-free performance; as well as rubber backing for optimum skid resistance. Printed on the same machines that manufacture one of the world’s leading brands of printed carpet, this rug is extremely robust and long-lasting. This technology allows the use of multiple colors to create a rug that is wonderfully designed and applicable to your design style and any floor type. Easy to clean with minimal effort, this rug also offers a carefree maintenance: just regular vacuuming will help it remain attractive and serviceable for a long time. All these exclusive features will make this rug the envy of your friends! Efficient low profile avoiding any bulk on your floor and allowing doors to open easily without snagging under swinging doors | You can have peace of mind - if you are not totally content with this rug, return it hassle-free for a full refund - we pride ourselves for having amazing customer service. Non-slip rubber backing that stays in place for safe and slip-free stepping | Ottomanson is the manufacturer and is the only authorized seller of this product. We cannot guarantee any quality or description accuracy of the purchase you make from any other sellers. Rotate periodically, spot clean with mild soap or detergent and vacuum regularly. Do not dry clean. [We DO NOT recommend machine washing our rubber back rugs because the pressure and heat may damage the rubber backing. Our rugs are made of premium.